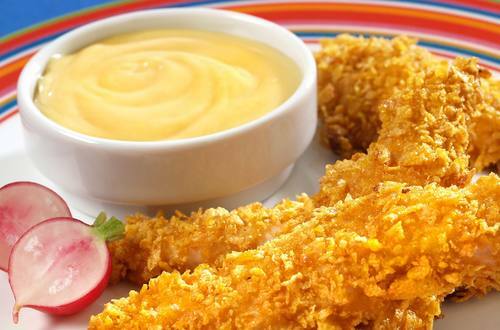 These pick-up-and-go crispy chicken fingers are sure to please the pickiest of eaters. 1 Preheat oven to 425°. Combine Hellmann's® or Best Foods® Real Mayonnaise, Hellmann's® or Best Foods® Honey Mustard in medium bowl; reserve 1/2 for dipping. 2 Add chicken to remaining mayonnaise mixture; stir to coat. Mix cornflakes with Parmesan Cheese, then roll chicken in crumbs. 3 Arrange on ungreased baking sheet. Bake 10 minutes or until chicken is thoroughly cooked. Serve with reserved honey mustard sauce.